FREE AT SEA SALE: Choose up to 5 Free Offers + Receive Up to $100 Onboard Credit per Stateroom on Select Sailings! Suite - Receive all 5! Pride of America is THE ONLY cruise ship that sails round-trip from Honolulu year-round, AND that sails 7-nights throughout the Hawaiian Islands. No other cruise line offers this. An award-winning itinerary gives you the most time in port – nearly 100 hours – ample time to fully enjoy the Aloha spirit, spectacular natural wonders, fascinating culture and serene beauty of our 50th state. So, whether you want to try a surf lesson, witness an authentic hula dance, hike a volcano, see breathtaking waterfalls, or relax on a pristine beach, a cruise through the Islands on Pride of America will offer you the ultimate exploration of these island paradises. Exclusive Amenity: Up to $100 Onboard Credit Per Stateroom Plus Free at Sea Amenities! Make this year the one you say Aloha the island paradises of Hawai`i. Contact our agency to book your cruise today. *Valid on 3+ night sailings. Free at Sea choice(s) must be selected at least 24 hours prior to sailing and cannot be changed on board. Suite bookings receive 5 offers; Oceanview, Balcony & Mini-Suites choose 2; Studio & Insides choose 1. Gratuities, Beverage and Specialty Service Charges may apply. Significant details and limitations apply to Free at Sea offers: Free Unlimited Beverage Package, Free Specialty Dining Package, Free WiFi, Free Shore Excursions, Friends & Family Sail Free (on select sailings). 20% gratuities apply to Free Unlimited Beverage Package and Specialty Dining. 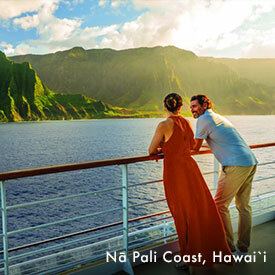 Hawaii Free at Sea: Valid only on Pride of America sailings. Free at Sea choices(s) must be selected at least 24 hours prior to sailing and cannot be changed once onboard. Bookings made within 24 hours of departure must select choice(s) at the time of booking. Pricing is per person based on double occupancy and is subject to change. Not applicable to categories IX, OX, BX or MX. Offer is capacity controlled and can be withdrawn at any time. Singles paying 200% of voyage fare qualify. Anything consumed above the promotional benefit will be the responsibility of the guest at prevailing rates. Guest cannot substitute or customize this offer. All guests in stateroom must choose same offer. Government taxes, port expenses & fees, discretionary onboard service charges and/or gratuities are additional. Cancellation Fees also apply based on the booking/sailing date; therefore, Norwegian Cruise Line strongly recommends the purchase of travel protection on all bookings. This is a cruise only offer. This promotion is not applicable on the land portion of Cruisetours or bundles. No components included in this offer have any monetary value, are non-refundable and non-transferable. Offer and combinability with other promotional offers is subject to change at any time per Norwegian Cruise Line's discretion. Other restrictions may apply. Norwegian Cruise Line reserves the right to cancel or withdraw this offer at any time. Pricing is per person based on double occupancy and is subject to change. For full terms and conditions please contact our agency. © 2019 NCL Corporation Ltd. Ships’ Registry: Bahamas and USA.